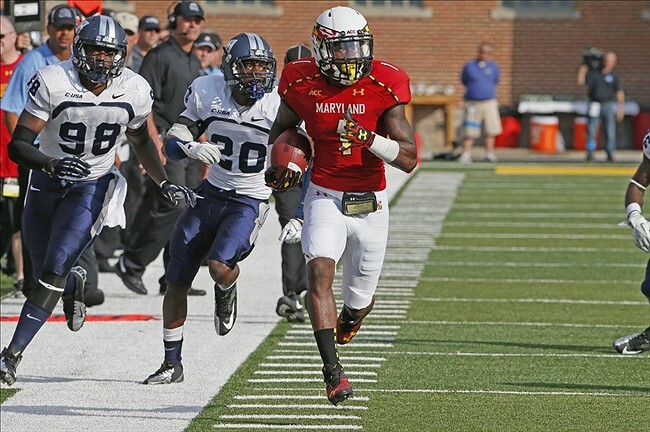 Stefon Diggs is one of the most electrifying players the Maryland program has seen in a long time. In two weeks he’ll be hearing his name called on draft weekend. For an in depth report on the local kid, who was a five star recruit from Good Counsel High School (Montgomery County), and U.S. Army High School All-American team member, I turn to resident Maryland football expert, Zack Kiesel, for his insight on the Terrapins receiver. Discuss your thoughts on this piece on our message board. Experts seem to think Diggs robbed himself of a higher payday by entering the draft a year early. Of course the other side of the coin is you take any opportunity that presents itself. In your opinion, is Stefon Diggs ready to play on Sundays? There is certainly a fair argument to be made on either side of Diggs’ decision, but most people expected him to leave after his junior year with the Terps. If he had stayed, he likely would have had a quarterback with a better arm throwing to him in 2015, but he ultimately decided that it was in his best interests to leave early. I believe that he is more than ready to play at the next level. He was the best player on Randy Edsall’s team for each of his three years in College Park, and has the skill set necessary to compete in the NFL. Maryland fans are certainly familiar with Diggs, but for those who maybe don’t follow college football often, how would you describe Diggs’ skill set? What are his strengths and weaknesses? ZK: Stefon Diggs is the prototypical college slot receiver. He has excellent agility and quickness, while also possessing the speed to get behind the defense on vertical routes. His footwork and route-running abilities got better each year with the Maryland Terrapins, especially after Randy Edsall hired former NFL wideout Keenan McCardell as his wide receivers coach before Diggs’ junior year. While he spent most of his time at slot receiver in offensive coordinator Mike Locksley’s multiple spread system, he also saw some time on the outside as the team’s flanker. His size (6’0″, 190 lbs.) and skill set gave him the ability to play both inside and outside for the Terps. The team had planned to move him outside permanently before the 2014 season to improve his NFL Draft stock, but were ultimately forced to move him back inside before the first game of the season due to Levern Jacobs’ suspension. Diggs’ main weakness is probably his route-running. While he has certainly improved himself in that regard during his time with the Terrapins, he still struggles to run crisp routes at times. In Locksley’s system, Diggs was mostly running vertical or underneath routes, while his outside receivers ran the routes typical of NFL receivers (digs, outs, posts, etc.). Based on his skill set, what kind of offense will Diggs be best suited in? More important to us locally, how about the Ravens West Coast system? ZK: With the NFL moving to offenses that feature more and more wide receivers and college-style concepts, Stefon Diggs will fit well into what many teams are looking to accomplish offensively. He would fit well into a slot receiver role for any team looking to spread the defense out with 3-4 wide receivers and throw more short and intermediate passes to get their receivers in space. He likely doesn’t fit into a team looking to execute an Air Coryell-type system where receivers are relied on to beat cornerbacks on the outside in one-on-one matchups. Diggs stands only 6-feet tall and does not have much experience running those types of routes. He is much more deadly when working in space either over the middle of the field or on the perimeter. Here are a couple clips of what Zack is talking about. Deadly over the middle. DIggs shows great vision and patience in the open field to turn short passes in to big gains. ZK: I believe that he would fit well into the Baltimore Ravens’ offensive system. The modern spread offenses that you see across college football and the NFL are based on the West Coast offense that was made so famous by Bill Walsh. It is a system built on short and intermediate passing routes, and relies on receivers to make plays in space. Those two things are exactly what Stefon Diggs excelled at in College Park. While Joe Flacco’s arm strength and love of deep passes makes the Ravens’ system a bit different from a true West Coast system, they still want to run shorter routes to get their receivers in space. Last season, Gary Kubiak ran a lot of plays out of formations featuring 3 wide receivers. If Marc Trestman continues that trend this season, Stefon Diggs would be a perfect fit for the slot receiver spot in the Ravens’ offense. How much of a red flag should Diggs’ injury history be to teams looking at drafting him? He’s suffered a broken fibula, lacerated kidney. Those aren’t nagging injuries. Those are major setbacks, although playing through the kidney is a credit to his toughness. I don’t think that I would categorize Diggs as “injury prone”, and I don’t think teams should be too worried about his history with injuries. Both of his major injuries were what I would call “fluke” injuries. It’s not as if he keeps injuring a knee or keeps suffering concussions. It should also be noted that both of his major injuries occurred when he was doing everything in his power to fight for extra yardage for either a first down or touchdown. What can you tell us about the incident prior to the Penn State game this past year? Do you find his character to also be a red flag? Refusing to shake hands with the opposing captains, and bumping an official during the scrum. Anything to worry about, or gamesmanship? ZK: I don’t see anything to worry about as far as Stefon Diggs’ character goes. He is one of the most well-spoken young men that has played for Randy Edsall and has a great head on his shoulders. The incident before the Penn State game was an example of a young player letting his emotion and passion get the best of him. He’s learned from that situation and has moved on. The team who drafts him will quickly learn what a great young man he is and what a natural leader he is. Back to the discussion between the lines. Maryland faced off with Michigan State and Ohio State this year. They will be sending corners Trey Waynes and Doran Grant respectively to the NFL draft. Waynes is arguably the best CB in the NCAA. Did Diggs mix it up with these men, and how did he fair against NFL talent to be? ZK: Diggs did not face Trey Waynes in 2014 due both to his suspension following the incident at Penn State and due to the lacerated kidney he suffered in that game. In the Ohio State game, Diggs did not face off against Doran Grant very often. Because of the way that the Terrapins used him in the slot, Grant was usually matched up against Deon Long on the outside. Diggs is a player who rarely disappears in games. Last season, he had just one game in which he recorded less than 5 catches (Wisconsin), and recorded over 100 yards receiving in 4 games. As the Terps began Big Ten Conference play, he had a streak of 4 straight games with a receiving touchdown. He isn’t a player to back down from a challenge, no matter who he is facing. Bottom line. Your expectations for Stefon Diggs going forward? ZK: While I think that his size will limit him a bit at the NFL level, there is no reason why Stefon Diggs can’t be a team’s #2 receiver, either in the slot or at flanker. He is a very coachable player who is always looking to improve his play. His skill set fits well into what many NFL teams are trying to do offensively, and I think he’d fit well into Marc Trestman’s offense for the Baltimore Ravens next season. I’m not sure whether or not he is a future Pro Bowler, but I certainly see him as a very solid and productive player at the NFL level. Thank you for your insight Zack. While it would be nice if Diggs could stay home and be a Raven in the next stage of his career, we wish his all the best as we anxiously await his name to be called. Diggs will be the fourth Terrapins WR drafted in the last six years (Darius Heyward-Bey in 2009, Torrey Smith in 2011, and Kevin Dorsey in 2013). If the Ravens select Diggs, it will be the third Terps receiver they have drafted (Jermaine Lewis in 1996, Torrey Smith in 2011).